When your adventures require more. Say hello to 4Runner TRD Off-Road and TRD Off-Road Premium—two tough SUVs to help you rule your favorite trails. This SUV stands apart with unique features like 17-in. 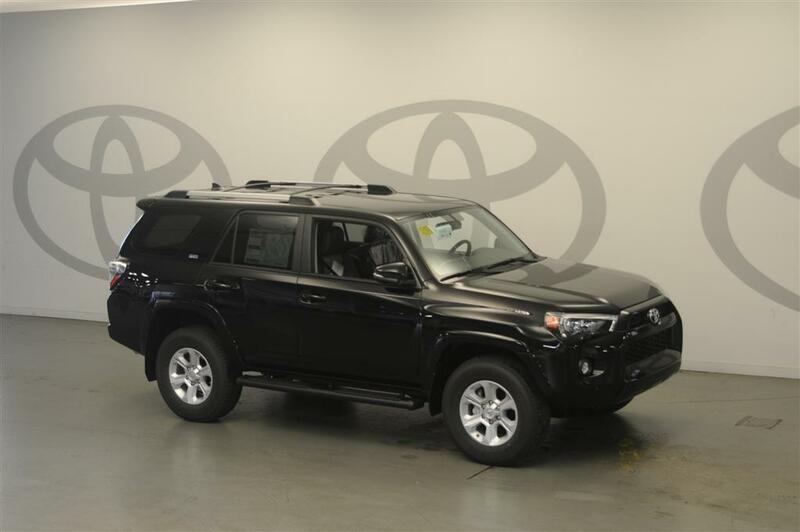 7-spoke alloy wheels with black-painted accents and stylish TRD Off-Road badging. The inside is just as awesome with its TRD shift knob, TRD Off-Road floor mats2 and available TRD headrest lettering. Every 4Runner grade has a unique wheel style to enhance its personality. The SR5 comes with 17-in. 6-spoke alloy wheels. TRD Off-Road features rugged 17-in. 7-spoke alloy wheels and black-painted accents. Limited has stylish 20-in. split 6-spoke wheels3. 3 The Toyota model or models shown are designed to meet most off-road driving requirements, but off-roading is inherently dangerous and may result in vehicle damage. Toyota encourages responsible operation to help protect you, your vehicle and the environment. Seatbelts should be worn at all times. Do not allow passengers to ride in cargo area. 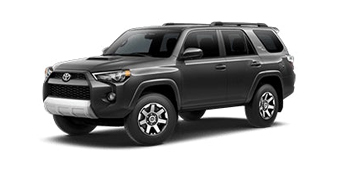 Function and style come together in 4Runner's projector-beam headlights. These headlights provide a stronger and higher-focused beam than conventional headlights, and the smoked trim adds a stroke of boldness to their style. These also incorporate Daytime Running Lights (DRL) to help make you more visible to approaching vehicles. It may look tough outside, but inside it feels exceptionally refined. That’s because we have used premium materials like SofTex® on the SR5 Premium and TRD Off-Road Premium grades, and perforated leather on Limited. It’s the perfect blend of ruggedness and comfort. All 4Runners feature an 8-way power-adjustable driver’s seat with power lumbar support. Step up to SR5 Premium or TRD Off-Road Premium and get a 4-way power-adjustable front passenger seat in addition to heated front seats. Limited adds heated and ventilated front seats, plus driver’s seat memory to automatically go back to your ideal position every time you strap in for a ride. Take it all in. 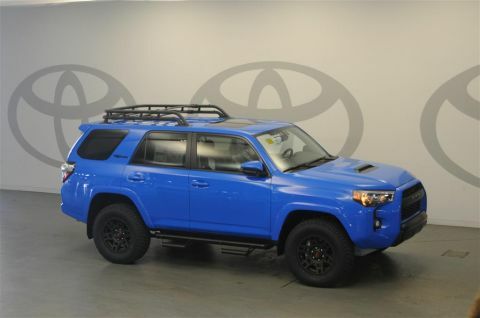 Available on 4Runner SR5 Premium and TRD Off-Road Premium and standard on Limited, the power tilt/slide moonroof brings you closer to the great outdoors, without even stepping out of the car. Designed to help optimize headrest position during certain types of rear-end collisions, driver and front passenger active headrests move slightly up and forward, helping to reduce neck injuries4. 4 Active front headrests can help reduce the extent of whiplash in certain types of rear-end collisions. 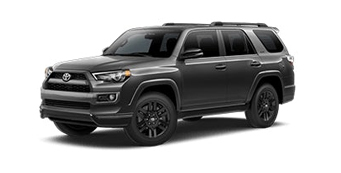 4Runner offers two different 4-Wheel Drive systems: SR5 4WD and TRD Off-Road models utilize part-time 4WD with Active Traction Control (A-TRAC), while Limited 4WD is equipped with a full-time 4WD system featuring A-TRAC and Torsen®5 limited-slip center differential with locking feature6. 5 Torsen® is a registered trademark of Zexel Torsen, Inc.
6 The Toyota model or models shown are designed to meet most off-road driving requirements, but off-roading is inherently dangerous and may result in vehicle damage. Toyota encourages responsible operation to help protect you, your vehicle and the environment. Seatbelts should be worn at all times. Do not allow passengers to ride in cargo area. The Kinetic Dynamic Suspension System (KDSS) and Crawl Control (CRAWL)7 are meant to help keep optimal traction, no matter how uneven the terrain is. KDSS automatically adjusts the suspension system for better wheel articulation, while CRAWL automatically modulates the throttle and brakes on five low-speed settings8. 7 Crawl Control is designed for driving on difficult terrain at low speeds. It assists the driver by controlling acceleration and braking, allowing the driver to focus on steering. The Toyota 4Runner is designed to meet off-road driving requirements, but off-roading is inherently dangerous. Always wear seatbelts. See Owner’s Manual for additional limitations and details. 8 The Toyota model or models shown are designed to meet most off-road driving requirements, but off-roading is inherently dangerous and may result in vehicle damage. Toyota encourages responsible operation to help protect you, your vehicle and the environment. Seatbelts should be worn at all times. Do not allow passengers to ride in cargo area. Multi-terrain Select allows you to choose from four modes that will help regulate wheelspin by adjusting the engine throttle setting and traction control to help provide you with maximum traction on various off-road situations9. 9 The Toyota model or models shown are designed to meet most off-road driving requirements, but off-roading is inherently dangerous and may result in vehicle damage. Toyota encourages responsible operation to help protect you, your vehicle and the environment. Seatbelts should be worn at all times. Do not allow passengers to ride in cargo area. All 4WD vehicles require a system to transfer power from the transmission to both front and rear wheels. TRD Off-Road comes with a lever-type transfer case to switch to low range to clear the roughest challenges you encounter, while an electronic transfer case on the SR5/Limited lets you switch with the turn of a dial. 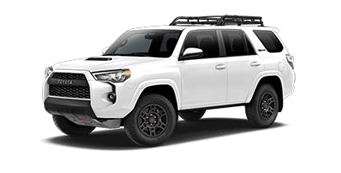 To help you negotiate uncertain terrain, 4Runner TRD Off-Road has an electronically controlled locking rear differential that evenly distributes engine power to both rear wheels, so they move at the same speed, even if one is off the ground10. It also helps to ensure a predictable output to help you maintain a controlled pace over obstacles. 10 The Toyota model or models shown are designed to meet most off-road driving requirements, but off-roading is inherently dangerous and may result in vehicle damage. Toyota encourages responsible operation to help protect you, your vehicle and the environment. Seatbelts should be worn at all times. Do not allow passengers to ride in cargo area. Integrated Navigation11 gives you turn-by-turn directions plug HD Radio™12 Predictive Traffic and Doppler Weather overlay--all straight from the 6.1-in. High-resolution touch-screen display. 11 Be sure to obey traffic regulations and maintain awareness of road and traffic conditions at all times. Availability and accuracy of the information provided by the navigation system is dependent upon many factors. Use common sense when relying on information provided. Services and programming subject to change. Services not available in every city or roadway. Updates may be available from your dealer at an additional cost. See Owner’s Manual for details. 12 HD Radio™ Technology manufactured under license from iBiquity Digital Corporation U.S. and Foreign Patents. HD Radio™ and the HD, HD Radio, and “Arc” logos are proprietary trademarks of iBiquity Digital Corp.
Bluetooth®13 wireless technology gives you hands-free phone capability, phone book access, advanced voice recognition14 and music streaming15, so you have access to your phone without even glancing at it. 13 Bluetooth® word mark and logos are registered trademarks owned by Bluetooth SIG, Inc., and any use of such marks by Toyota is under license. A compatible Bluetooth®-enabled phone must first be paired. Phone performance depends on software, coverage and carrier. 14 Advanced voice recognition capabilities vary by head unit. 15 Bluetooth® word mark and logos are registered trademarks owned by Bluetooth SIG, Inc., and any use of such marks by Toyota is under license. A compatible Bluetooth®-enabled phone must first be paired. Phone performance depends on software, coverage and carrier. 16 JBL® is a registered trademark of Harman International Industries, Incorporated. The standard integrated backup camera17 display not only helps with backing into a tight spot, but is also the perfect companion for hitching your trailer. Now you can keep an eye on the important things, like your boat. 4Runner Limited’s standard sonar18 sensors, located in the front and rear bumpers, help make parallel parking easier by detecting obstacles and warning the driver with a series of tones. 17 The backup camera does not provide a comprehensive view of the rear area of the vehicle. You should also look around outside your vehicle and use your mirrors to confirm rearward clearance. Environmental conditions may limit effectiveness and view may become obscured. See Owner’s Manual for additional limitations and details. 18 Front and rear parking assist sonar is designed to warn drivers of potential front and rear collisions at speeds of 6 mph or less. Certain vehicle and environmental factors, including an object's shape and composition, may affect the ability of the front and rear parking assist sonar to detect it. Always look around outside the vehicle and use mirrors to confirm clearance. See Owner’s Manual for additional limitations and details. 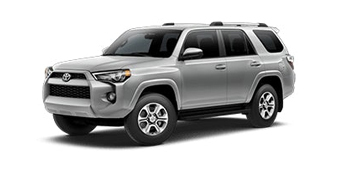 4Runner is prepared to help protect you and your passengers with our driver and front passenger Advanced Airbag System, driver and front passenger TAP (Thorax, Abdomen, Pelvis) front seat-mounted side airbags, driver and front passenger knee airbags and all-row Roll-sensing Side Curtain Airbags (RSCA)19. 19 All the airbag systems are Supplemental Restraint Systems. All airbags (if installed) are designed to inflate only under certain conditions and in certain types of severe collisions. To decrease the risk of injury from an inflating airbag, always wear seatbelts and sit upright in the middle of the seat as far back as possible. Do not put objects in front of an airbag or around the seatback. Do not use a rearward-facing child seat in any front passenger seat. See Owner’s Manual for additional limitations and details. To help provide extra occupant protection if the vehicle is stuck from the side, impact beams are located inside all doors and are designed to absorb energy and help reduce the chance of intrusion into the cabin. Proper tire pressure is important not only for good handling and fuel economy, but also for your safety. 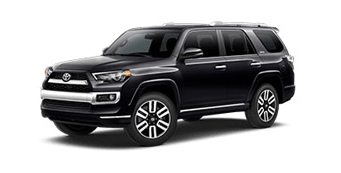 4Runner’s standard Tire Pressure Monitor System (TPMS)20 evaluates the pressure of the tires and issues a warning if the pressure becomes critically low. 20 The Toyota Tire Pressure Monitor alerts the driver when tire pressure is critically low. For optimal tire wear and performance, tire pressure should be checked regularly with a gauge; do not rely solely on the monitor system. See Owner’s Manual for details. Toyota is devoted to safety and dependability, and proper vehicle maintenance is important to both. 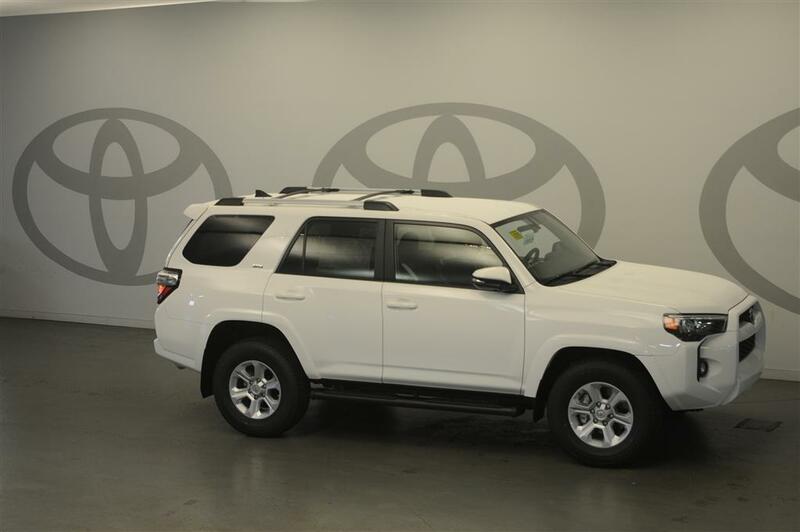 That’s why we include a no cost maintenance plan that covers normal factory scheduled maintenance with the purchase or lease of every new 4Runner for 2 years or 25,000 miles, whichever comes first.21. 24-hour roadside assistance is also included for 2 years and unlimited miles22. 21 Covers normal factory scheduled service for 2 years or 25K miles, whichever comes first. See Toyota dealer for details and exclusions. Valid only in the continental U.S. and Alaska. 22 Roadside Assistance coverage is 2 years unlimited mileage. Does not include parts and fluids, except emergency fuel delivery. See Toyota Dealer for details and exclusions. Valid only in the continental U.S. and Alaska. 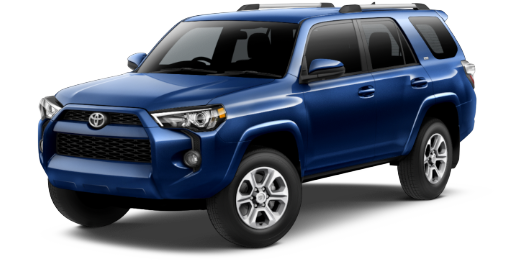 4Runner comes standard with our Star Safety System™, a suit of six safety features designed to keep you out of harm’s way. It includes Vehicle Stability Control (VSC)23, Traction Control (TRAC), Anti-lock Brake System (ABS), Electronic Brake-force Distribution (EBD), Brake Assist (BA)24 and Smart Stop Technology® (SST)25. 23 Vehicle Stability Control is an electronic system designed to help the driver maintain vehicle control under adverse conditions. It is not a substitute for safe and attentive driving practices. Factors including speed, road conditions, weather and driver steering input can all affect whether VSC will be effective in preventing a loss of control. See Owner’s Manual for additional limitations and details. 24 Smart Stop Technology® operates only in the event of certain contemporaneous brake and accelerator pedal applications. When engaged, the system will reduce power to help the brakes bring the vehicle to a stop. Factors including speed, road conditions and driver input can all impact stopping distance. Smart Stop Technology® is not a substitute for safe and attentive driving and does not guarantee instant stopping. See Owner’s Manual for details. 25Brake Assist is designed to help the driver take full advantage of the benefits of ABS. It is not a substitute for safe driving practices. Braking effectiveness also depends on proper vehicle maintenance, and tire and road conditions. See Owner’s Manual for additional limitations and details. * MSRP excludes the Delivery, Processing, and Handling Fee of $920 for Cars (Yaris, Yaris iA, 86, Corolla, Corolla HB, Camry, Camry HV, Prius LB, Prius c (ITALICS AND SMALL c), Prius Prime, Mirai, Avalon, Avalon HV), $1045 for Small/Medium Trucks, SUVs and Van (C-HR, RAV4, RAV4 HV, Highlander, Highlander HV, 4Runner, Sienna, Tacoma), $1,295 for Large SUVs (Sequoia, Land Cruiser), and $1,395 for Large Truck (Tundra). (Historically, vehicle manufacturers and distributors have charged a separate fee for processing, handling and delivering vehicles to dealerships. Toyota's charge for these services is called the "Delivery, Processing and Handling Fee" and is based on the value of the processing, handling and delivery services Toyota provides as well as Toyota's overall pricing structure. Toyota may make a profit on the Delivery, Processing and Handling Fee.) Excludes taxes, license, title and available or regionally required equipment. The Delivery, Processing and Handling Fee in AL, AR, FL, GA, LA, MS, NC, OK, SC and TX will be higher. The published prices do not apply to Puerto Rico and the U.S. Virgin Islands. Actual dealer price will vary.